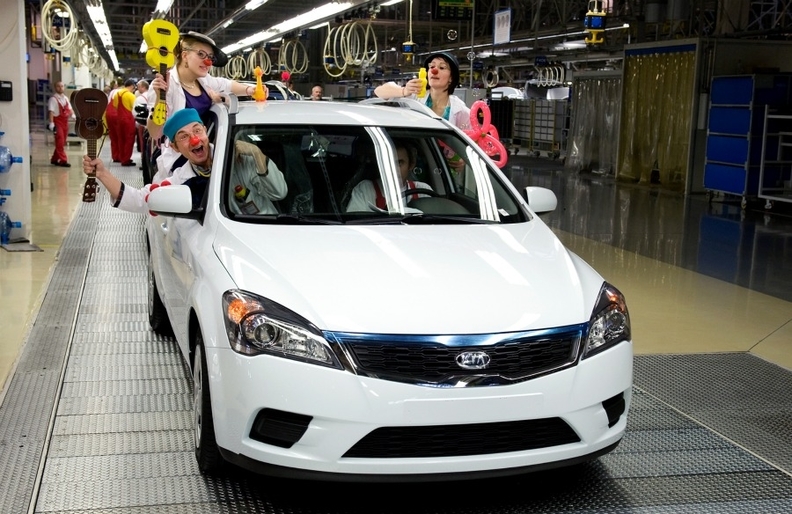 The one millionth Kia car built in Zilina, a white Cee'd station wagon, was donated to charity. LONDON – Kia has built its one millionth car at its factory in Zilina, Slovakia, five years after production first started. The factory plans to produce 285,000 cars this year after increasing production by 10 percent last year to 252,000 vehicles and engine production by 12 percent to 359,000. The plant started production in December 2006, initially making the Cee'd compact car. Since then Kia has added production of the Sportage medium SUV and Venga small minivan, as well as production of engines that are shared with sister brand Hyundai. The factory benefits from closeness to Hyundai's plant Novosice in the Czech Republic, which started production in November 2008. Last year the Novosice plant built 251,000 cars, an increase of 50,000 from the year before. "Kia Motors Slovakia has achieved an important milestone in its history with the production of the millionth car," said Eek-Hee Lee, CEO of Kia Motors Slovakia, in a statement. The one millionth car, a white Cee'd station wagon, was donated to a Slovakian children's charity.